More than 100 Juventus fans were detained by Dutch police ahead of their club’s Champions League quarter-final first leg tie against Ajax in Amsterdam, while home fans were also arrested outside the ground. 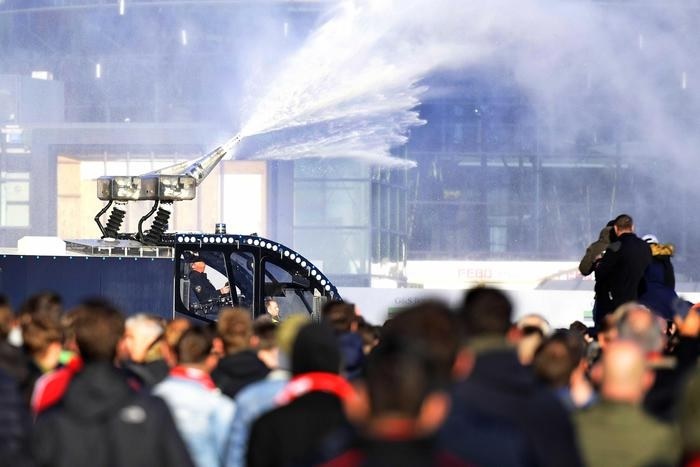 Amsterdam police arrested several supporters with fireworks after warning in the days leading up to the game that they would not allow fans to let them off outside the stadium in what has become a pre-match ritual. Local broadcaster AT5 released footage of masses of chanting fans being hosed by a water cannon and responding by tossing fireworks and flares at police before mounted officers charged at them, followed by riot police. Earlier, police said two separate groups of Juventus fans had been held after searches found them carrying fireworks, sticks, pepper spray, screwdrivers and a hammer. Photos of a confiscated knife, fireworks, pepper spray, flares, a hammer and a baton were shown in a press release by law enforcement authorities in the Netherlands. A first group of some 46 Juventus fans were held at the stadium’s metro station in the hours before kickoff as Dutch and Italian forces worked together to identify potential troublemakers, the police added. A second group of 61 supporters were stopped and held in the vicinity of the stadium.